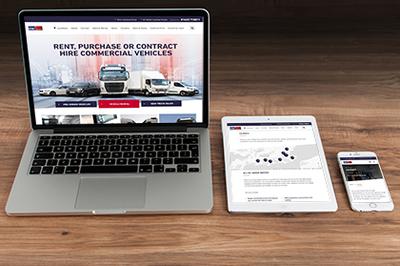 Independent commercial vehicle dealer MC Group launched their completely redesigned website this January. The newly developed site combines the Group’s previous two websites, into one mobile friendly destination. MC Group, which is comprised of MC Truck and Bus Ltd and MC Rental Ltd, previously had a website for each business. The new Group site consolidates the two, aligning all divisions under one digital roof. Another key objective was to make the whole site experience more enjoyable and less time consuming for visitors. Design features contribute towards a tailored user journey with consistent display of information. Updates include clear access to customer login areas alongside key information and policies, up-to-date news and group financials. The user can find information on the products or services offered whilst being directed to the relevant contact. The trend towards using mobile and smart devices was central to design. The site is fully responsive, which aims to give the best user experience regardless of screen type or size. “We keep an eye on digital trends and are very active on social media. It makes sense the website should reflect our approach to building a strong brand presence online” explains Hutchins. He concludes “It may sound like a cliché but we take pride in being a one-stop-shop for commercial vehicles and now our website demonstrates this”. Visitors are encouraged to take a look at the website and contact the company directly at mcgroupltd.co.uk.